It's an expensive way to kit out your iPhone's camera, but if you're serious about your photography you'll quickly see where the money's been spent. The 0.6x wide-angle is our favourite, and its optical quality is excellent. There's no shortage of clip-on accessory lenses for the iPhone, although you wouldn't usually expect much in terms of image quality. But the iPhone has a serious camera with a rather good built-in lens, and it's taken seriously by a lot of pretty serious photographers. That's the thinking behind the Exolens Zeiss tie-in, whereby Exolens provides the smartphone mount and Zeiss supplies the lenses. The Zeiss name will be familiar to keen photographers out there, and it has a long-established reputation for optical excellence in the high-end camera market. 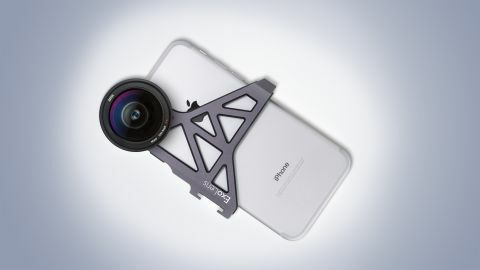 But it's one thing producing top-quality lenses for cameras, of course, and quite another creating add-on accessory lenses for smartphones. The Zeiss Exolens solution comes in two parts – the iPhone adaptor you mount the lenses on, and the lenses themselves. Exolens has just announced a newly updated mounting bracket for the iPhone 7, bringing its iPhone support bang up to date... well, nearly. The iPhone 7 Plus poses a different problem, because of course it has its own built-in telephoto lens, but Exolens says it's working on it. The three lenses are, as you might expect from the Zeiss brand, pretty pricey, but they are designed and built to a high standard. The 0.6x wide-angle and telephoto both use expensive 'aspheric' lens elements, and it's clear from the moment you pick them up that there's a lot of very serious glassware inside those nicely-finished metal barrels. The iPhone 7's regular lens is roughly equivalent to a 28mm wide-angle, so the Zeiss 0.6x wide-angle lens (above) stretches this to 17mm equivalent, which is very wide indeed. It enables you to take in sweeping landscapes, tall buildings and cramped interiors which you would previously have needed a DSLR or CSC with a super-wide lens to capture. The 2x Zeiss lens (above) gives the iPhone camera an effective focal length of 56mm. That's not quite long enough to produce the flattering facial perspectives that portrait photographers love, but it's a lot better for photographing people than the regular wide-angle lens. The extra focal length could save you from using the iPhone's digital zoom, but it doesn't offer the zoom range of a regular compact camera, say, unless you factor in the iPhone’s digital zoom, which is going to degrade the image quality. The macro lens (above) is interesting. It has a ring for controlling the focal length to help you focus at the right distance to your subject, and a circular diffuser where the lens hood would be – you can get so close that this is touching your subject, but without blocking the light. Zeiss calls it a variable zoom, but in practice this control is used to adjust the focus range at different distances. It's easier to use than it is to explain, but not much. Frankly, the mounting bracket does look a bit crazy, but it does a terrific job. The iPhone pushes in pretty tightly thanks to custom-made soft inserts, and once it's in place it's pretty clear that nothing's going to shake it free. Apart from being a snug fit, the mounting bracket has two other useful touches: a 'cold-shoe' mount for attaching an LED panel or an external microphone, and a tripod socket for shake-free long exposures. Next you attach your chosen lens, via a pretty fine-pitched screw thread. If you've got cold fingers or you're running short on patience, this can get a bit trying, so you just need to be a little slow and careful. It's unlikely you'll be changing lenses all that often, but if you go for the whole set you might find the screw-mount somewhat frustrating. As for taking pictures – nothing changes. You don't need a special app, you don't need to change any settings on the camera and you don't need to change the way you use it. You just see a wider, longer or closer view on the display, depending on which lens you're using. Once fitted, the lenses do mess with the balance of your iPhone, giving it a very top-heavy feel. You soon get used to it, though, and the bracket and lens do give you a bit more to get hold of when you're taking pictures. It's perfectly feasible to carry the phone and lens combo in an inside jacket pocket, with the lens overhanging the lip of the pocket. These lenses cost plenty, so they'd better be good – and they are. We spent most time with the 0.6x wide-angle, since this is where we'd normally expect to see any optical compromises creeping in. However, it delivers sharp detail right up to the edges of the frame, and with no observable distortion at all. This is pretty rare, even in a DSLR lens, so to get this kind of performance in an iPhone add-on is impressive. In many ways, this is the most important lens in the trio – it fills a real need for iPhone users, capturing a much wider angle of view. You can try shooting a panorama, of course, but you often get issues with parallax, passers-by and skewed horizons. The telephoto lens is equally impressive, but probably not as useful unless you spend a lot of time on people shots or you find the angle of view of the iPhone's regular lens just a little too wide for the way you see the world. iPhone 7 Plus users will need to wait to see how Exolens tackles its dual-camera design. The macro lens is a lot of fun, but the need to adjust the zoom now and again can be a bit of a fiddle – on the upside, you can get amazingly close to your subjects. The Zeiss Exolens products cost a lot more than regular clip-on iPhone lenses, but these are serious photographic tools, not hipster novelties. There are lots of photographers out there who use iPhones for 'proper' photography, and who may not have tried accessory lenses yet, simply because they don't trust them to be good enough. Well, these are. The Terminator-style bracket frame is a bit of a turn-off for those hoping for something more discreet, but there's some good news here, too. Exolens already makes a smaller Edge connector for its regular clip-on lens products, and we're told there will be an iPhone version, which will go on sale in January. This slides across the top corner of the iPhone over the camera lens and, while it doesn't quite offer the firm grip of the regular bracket, it is a lot less bulky. Both the bracket and the Edge require you to remove any existing iPhone case, which will be a drawback for many. Next year, however, there will be a full iPhone case, so that your phone stays protected if you don't want to use additional lenses, and it only takes a few moments to screw one in if you do. For now, you can buy the Exolens bracket and lenses ‘a la carte’. Previously, the wide-angle lens and bracket came as a kit, and the other two came separately, but now you buy the bracket and wide-angle separately too.